In a mixing bowl, cream butter and sugar. Beat in egg and molasses. Combine the flour, ginger, baking soda, cinnamon, cloves and salt; gradually add to the creamed mixture. Roll into 1-1/2-in. balls, then roll in sugar. Place 2 in. apart on ungreased baking sheets. Bake at 350 degrees F for 10-12 minutes or until puffy and lightly browned. Remove to wire racks to cool. I made these twice, once with brown sugar, once with white. Excellent cookies either way. Mine were baked in 8 minutes. 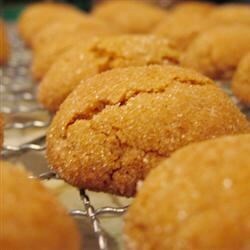 I prefer these made with butter-excellent cookie, been making these for years. I let them sit over night in the fridge, easier to roll them. These were so delicious! I may have found what I hope will become my "signature" cookie!